Yes, that's right, I'm putting some robots up for sale on etsy tomorrow. In fact, they're famous robots - they were on the cover of the first issue of Craft magazine. I've held onto them for a while (in dust-free storage, of course), but I figured I needed to share the joy. Please swing by my etsy store around noon tomorrow (California time) to snag one. They may actually go up a little later, just refresh until you see them. 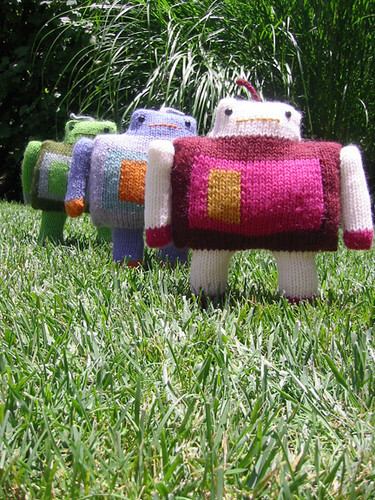 I will also have a couple other knitted toys, these ones are brand new. Although, if you don't see them, it means that I'm running behind in getting them posted, so check back a bit later in the day. I've got a sloooow connection so sometimes things take a while. So, um... how are you guys? Having a good holiday season so far? Oh, how I wish I was able to buy the booklet with the robots before it was gone forever! I simply love them! I'd forgotten how much I like your robots. Must dig out my copy of the booklet (I'm lucky enough to have one). Are you ever going to be able to make a real book deal for your patterns? I just love your stuff and would love seeing more toys from you. darn! I missed it and they all sold out! Oh, how I adore these robots. They're just so charming! PLEASE, PLEASE, PLEASE reprint your booklet, or make it available as a PDF file. I would love to make your robots and your other toys. You are so talented, I bet you could easily get a knitting book published if you put your mind to it! I would buy several copies and give it to all my friends.